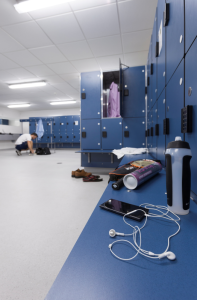 Altro safety flooring and hygienic wall cladding are providing the highest standard of safety, hygiene and aesthetics for athletes at the University of Bath’s renowned £30 million Sports Training Village (STV). The STV is an indoor and outdoor facility that accommodates more than 50 sports and regularly hosts major international competitions, as well as being a world-class multi-sport training environment. There has been major investment in improving the facilities at the STV, including a £1.6m refit to the swimming pool, which included Altro WhiterockTM hygienic wall cladding in the changing area. More recently, Altro Whiterock was chosen again, alongside Altro AquariusTM safety flooring, for the refurbishment of the dry changing areas. STV Sports Facilities Manager, Ron Stewart, explains why Altro has been selected for these projects. “The University has been using Altro Whiterock for many years as standard in its shower areas, so we know that it’s a great product — superb quality, easy to clean and with a contemporary look. Altro Whiterock White is the hygienic alternative to tiles that’s impact resistant, grout-free and easy to clean. Its smooth white surface and classical purity make it a timeless choice for any interior. Made from a high-quality, food-safe PVCu polymer, Altro Whiterock can handle temperatures up to 60°C. It meets all current European Union (EU) Directives on health and hygiene. Ron continues: “For the refurbishment of the dry changing area, Altro Whiterock was number one choice again, but we also needed to find a much better quality vinyl safety flooring, because what we had was terrible. It was costing us a fortune to patch up because it kept cracking, and the joints were failing. We wanted a serious upgrade in quality, a modern product that looked great, and something that would stand the test of time and be easy to clean. Altro Aquarius was developed to deliver optimum slip resistance in combined wet and dry areas, with shoes or bare feet — so it’s ideal for bathrooms and changing areas. Like all Altro safety flooring products, Altro Aquarius offers sustained slip resistance for the lifetime of the product, keeping your risk of a slip to just one in a million. The 2mm range features plain and tonal chip options, including an on-trend indigo shade to help achieve high contrast and design flexibility. It’s also easy to clean, with Altro Easyclean Maxis PUR technology. The Altro flooring and hygienic wall cladding was fitted by Quadrant Contract Flooring, who have use Altro products for more than 20 years. Quadrant Contracts Director Simon Allan, says: “In the past 10 years we have added Altro Whiterock to our portfolio, alongside Altro flooring, because we were getting so many enquiries that it made sense to offer both as part of our service. “We specify Altro for the majority of our work because we believe it’s the best on the market. It’s British-made, so supply is always good, and the support we get from Altro is great. 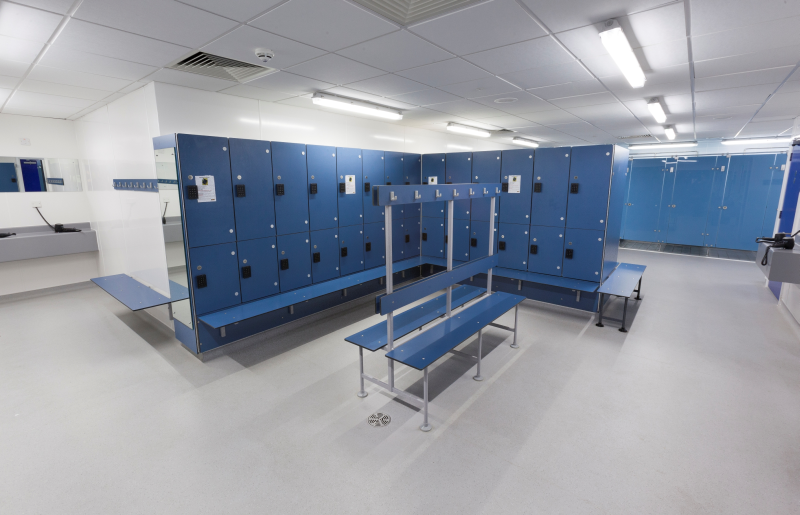 “The installation of Altro flooring in the changing areas wasn’t without its challenges. The area was redesigned to be open plan, but the floor levels were not uniform, which meant we had to do a lot of work to ensure they were even. There were also some moisture issues, which required laying a dpm. Like all Altro products, Altro Aquarius is very easy to work with, and goes down well. We used AltroFix 19 Plus adhesive to lay the flooring. Ron Stewart adds: “I am delighted with the Altro products used. The installation was handled well and was delivered to a very short working window. “The Altro Whiterock looks great, we will continue to use it and recommend it wherever there is a need here. It’s so easy to clean as well, which is major bonus for our maintenance staff. Next Win an Acer U5220 projector: perfect for any classroom set up and worth £1000!